My Fusion Theater Chairs arrived today. These are Romans new personal line of chairs and I bought the Lagoon model with power recline and leather/vinyl match. First of all Roman lived up to his reputation by providing good comunication about my order status and shipping status/tracking. -I love the new leather smell. -The seats are very comfortable yet still kinda firm. These are not the kind of chairs that you "sink into" when you sit in them. -Good support from head to heal with the chase style. -BIG cup holders with a stainless insert that handless my big cups just fine. 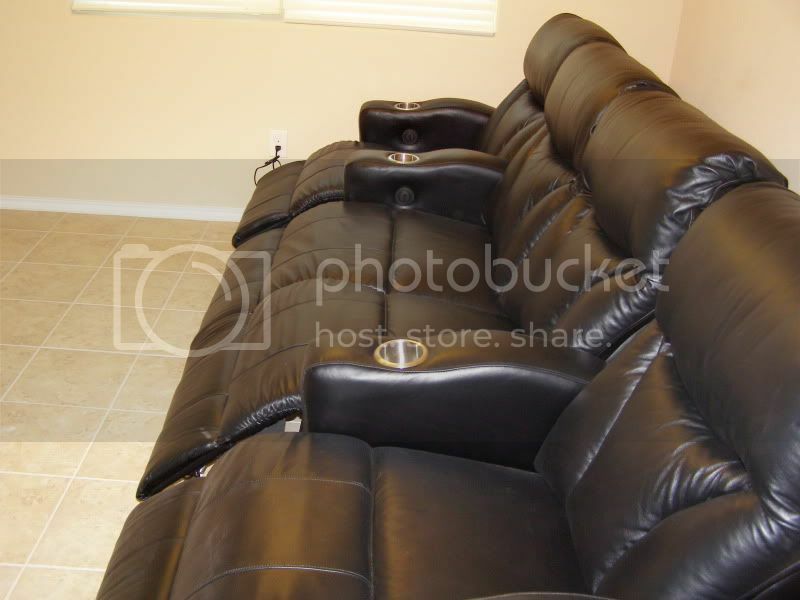 -The recline buttons are on the inside wall above the cushion and are easy to find and use while sitting. So far we like them and are waiting for our carpet dye to dry before getting them into our theater where they will be used. oneeyeblind, Damien Inferno and TheNightwisher like this. 1. Roman is the man. As always, he answered every email I sent him and kept me posted along the way. He's a real professional and very helpful - and very honest too. I told him point blank I was willing to spend a lot more on chairs but he encouraged me to save my money and try these as he was confident I would be happy with them. 2. As the original poster stated, these are firm chairs but that's what I like so much about them. The Berkline's I owned were way too "spongy" and offered no support. These babies are solid and I expect in time they will soften as well but they won't be spongy like the Berkline's - which again for me is a good thing. 3. The back supports and the overall build quality of these chairs is very solid. My Berkline's felt cheap. These feel very solid and "expensive." 4. The cup holders are great but I want to make a recommendation to these manufacturers. Line the bottom of these cup holders with cork or some other type of coaster material. Otherwise when your beverages sweat, you have a puddle of water in the bottom of these cup holders. I went out and bought cork material and just cut out 4 coasters and dropped them in the cup holders. Works like a charm but it seems like a no-brainer that they should be cork-lined in the first place. 5. These chairs have the pocket coils which is very important to know. My old Berkline's didn't have pocket coils so the result was the seat cushions would practically sink to the floor when I sat down. Roman told me with pocket coils, you won't get that "seat sagging" affect nearly as much over time. All-in-all, I give these chairs a 5 out of 5 stars so far. I'm crossing my fingers I'll be saying the same thing a year from now! noshank and oneeyeblind like this. Thanks guys for the review. I will say at first glance the chairs look "under" packed. I assume in both instances there was no damage? Also a "firm" chair worries me a bit. I like my chairs, sofas and mattresses to be on the soft side. I like the feeling of sitting/laying down and sinking in a bit. Are these really firm and do you believe that they will break in a bit over time? Just some little nitpicks on my part but in all I want to make the "right" decision when it comes to the seating I choose for my theater. The packaging was actually really good. 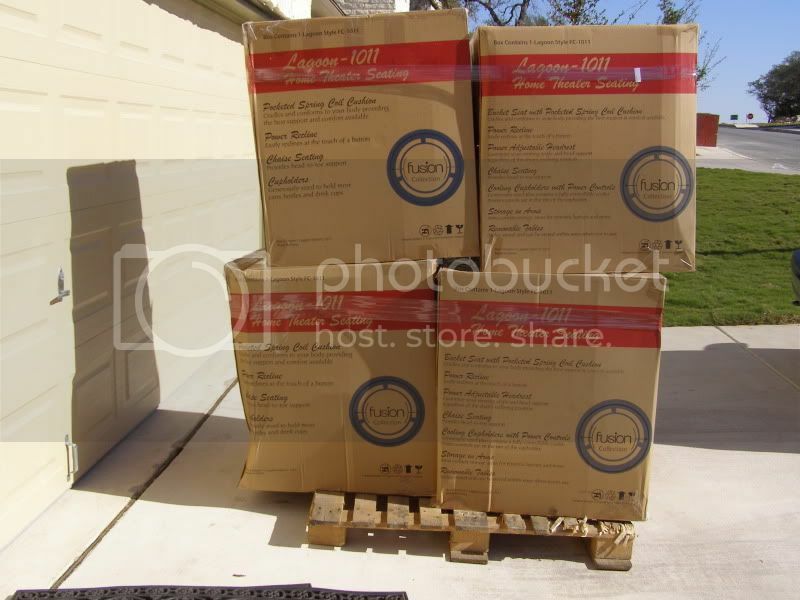 My kids (ages 6 and 4) decided it would be fun to walk across the tops of the boxes as they were sitting in my garage. I was freaking out but when I opened the boxes the chairs weren't even touched. 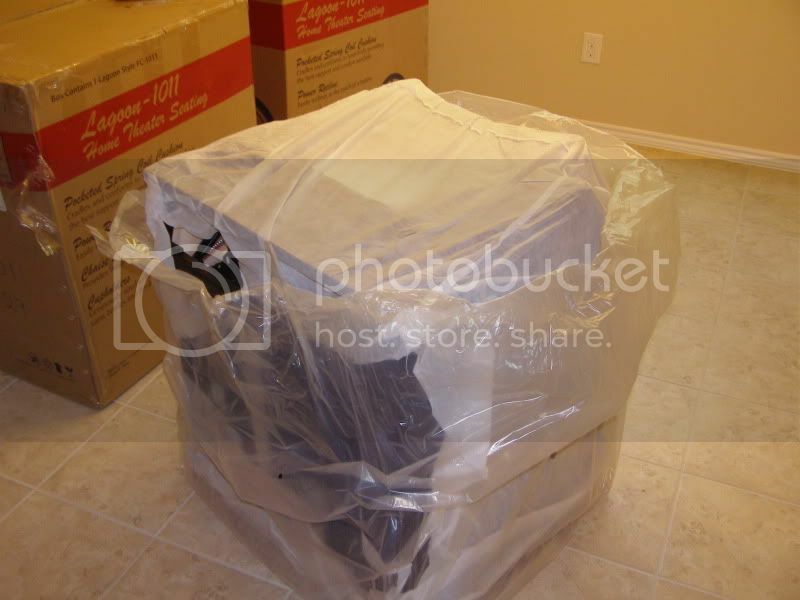 And the chairs themselves were packed really tight in the boxes. And there was no damage at all to any of the chairs. As for the firmness issue, these are firm chairs. The first thing my wife said when she sat in them was, "Wow...these are pretty stiff." (insert dirty joke...lol). The point is, she didn't know anything about these and that was her first reaction. I have to admit, it was the first thing that came to my mind too. Having said that, my Berkline chairs were pretty stiff at first too (but not as stiff as these) and they got really cushioning over time - too cushiony for me. I suspect since these are leather, they too will loosen up in time but they won't be nearly as soft as the Berkline's, which is a bonus for me. I did not have any damage. Two of the boxes were crunched and I was nervous when I was unpackaging them however nothing was damaged. I was surprised that they were not double boxed , but everything worked out ok.
i ordered the escape and they are at my house now, but unfortunately I'm still at work. Wish I could be at home so that I could also take a ton of pictures. I ordered 10 chairs so it's filling my entire lobby of my house. Lobby? I guess that's what that area is that people walk into. I have chair envy. The electric head rest is something I wish I had! ahh yes foyer, well i'll take a picture tonight, i'm getting a new screen put into my media room and then moving all of the chairs up. so how are the chairs working out? How tall are you guys? 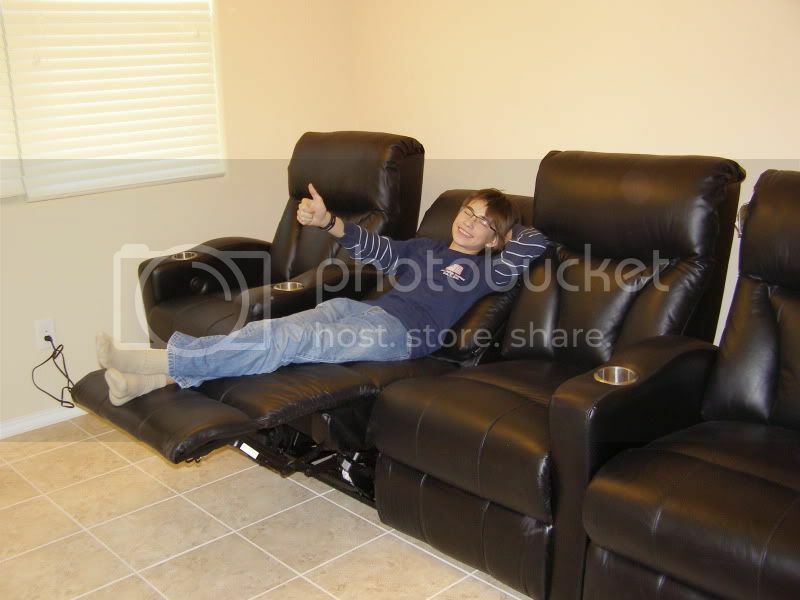 I though I saw these models were 65" reclined. How is that going to fit someone taller? my chairs are being setup today by my wiring guy while i'm working so i should be able to have see the tonight. i'm very much looking forward to them when i get home. i'm 6'2", so should be fine, plus can't wait to try adjustable headrest. Which will also give you plenty of time to test the chiller feature of the cup holders. I received the Fusion Escape a few days ago. I'll give a quick review. Roman received my payment on Tuesday, and on Friday had this in my driveway. Now that's fast shipping. The shipping company called the day before to schedule the delivery and informed me they would call 1 hr. prior to arrival. They didn't call so it was a bit of a surprise when I got home. Assembly is pretty straight forward, attach backs to base, attach plug for headrest and plug em in. Fully reclined, headrest all the way up. This is useful when fully reclined to keep your head propped up. This was a little troubling. Someone got careless or lazy. It's in the back and no-one will notice but me. But, If bought locally I would be exchanging because of this, ymmv. I'm curious if the other manufacturers in this price range have similar problems from time to time. I wasn't expecting perfection in this price range however. If it were elite seating I'm sure this wouldn't be acceptable. Styling and comfort are great. They are what I consider medium firm. They are perfect for me. I don't like a saggy chair, but one that is firm and softens up just right when you warm it up. Very comfortable. I spent six straight hours in them during football this past weekend. The drink coolers do work. They make a slight buzz/hum when their on but nothing that would distract unless your watching a quiet movie. I hope they last as long as the chairs as I like this feature. I'm a beer drinker ya know. Middle chair with headrest up. 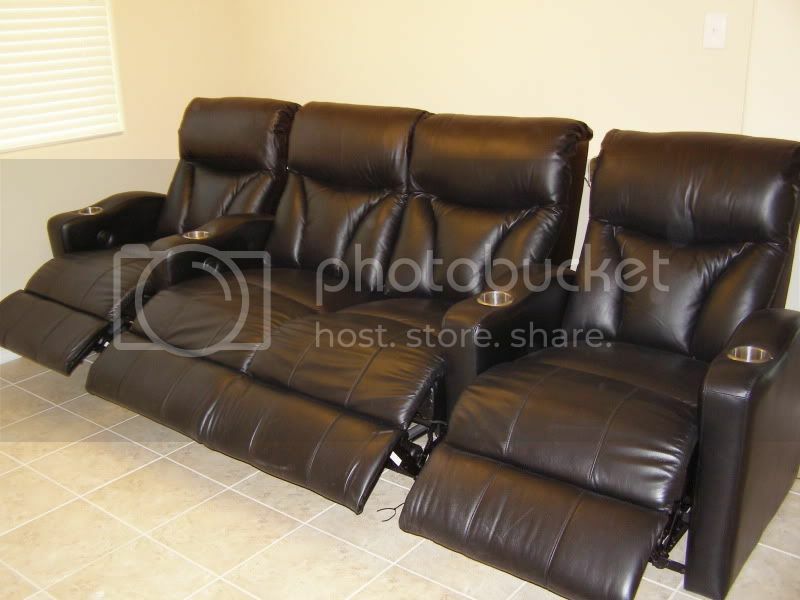 Storage in four armrests. Includes three tray tables. The tray tables are another nice feature. I may make my own out of some real wood as these are plastic. I think of it as an easy diy project that can class it up even more. All in all I'm pleased with this purchase. I've been watching for three years trying to decide on new chairs but nothing really did it for me styling wise except the expensive Elite seating chairs. These do it for me at a fraction of that price. The fit and finish isn't in that league but I knew that going in. And as everyone else has said, Roman was the reason I made a blind purchase for furniture. He was available for my questions late on a Saturday night. I appreciate that. Durability and reliability I don't know. I got the 5 yr. warranty and because of the electronics I think the $90 bucks is probably worth it. Time will tell, it always does. Great shots and review! I'm considering these also because I hate being fully reclined and having to put a pillow under my head to see the screen. Your screen looks to be about the same height as mine. I'm 5'9 though, so wondering if those headrests might be too far up on me. 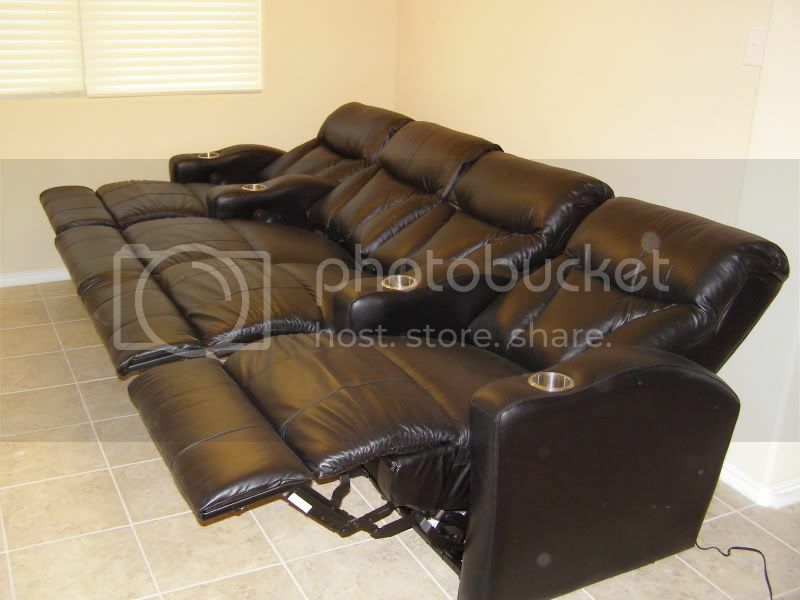 Any chance you could take a picture of someone in the chair fully reclined with the headrest in a comfortable viewing position? Do you expect to use the motorized headrest adjustment often? Thanks! prices? or you are not allowed to post prices? I'm 5' 11" and I would say the seat is about perfect if not an inch or so to big. When the seat is in it's upright position and my back is firmly into the backrest as it should be, my feet don't touch the ground. These chairs are elevated to be sure which add's to their appeal for me. When fully reclined and utilizing the head rest support I'm just below the perfect support spot under the back of scull. But regardless of height you just unconsciously position your body in whatever way makes it happy. Thanks for the reviews, I have 5-Lagoons coming on monday. Glad I got white glove, 400-foot driveway and a steep hill to go into the walkout basement. i have to charge my camera so i can't post any pictures yet but the chairs are fine. One minor problem with one of the led lights, which I already asked roman about, about 15 minutes ago. I've been working a ton lately. I have an amazing tale of two cities. Within a couple of weeks I purchased two sets of chairs for two different rooms from two sellers. My first chairs were a set of Berkline Apollos. I had seen the style and really wanted these. I like the power headrest and was excited for the arrival. What a dismal experience thus far. 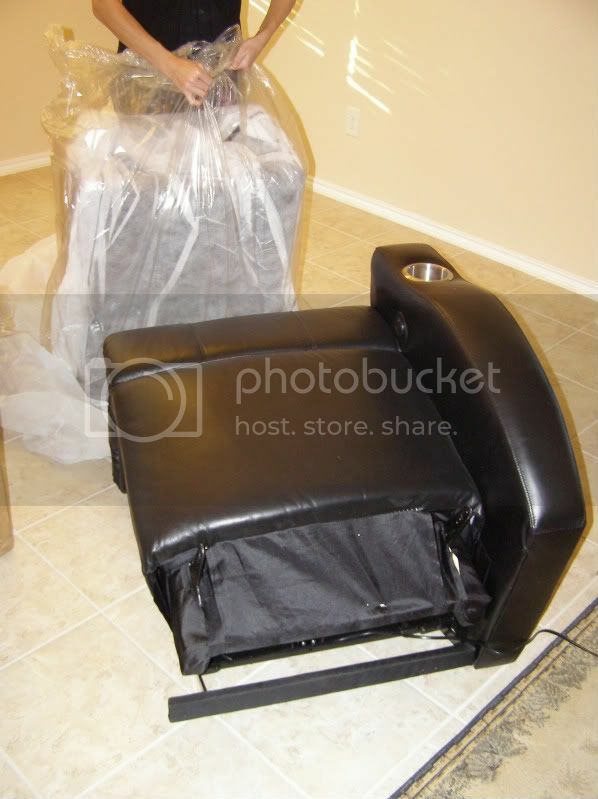 The chairs arrived with grease all over them from improper packing. I was pretty pissed. Then, as I tried to get them operating, I noticed a hack-job electric tape repair where wiring had been puled from the harness. Now, quite some time later these issues are still unresolved. My second purchase was to take a flyer on some guy named Roman selling chairs I'd never seen nor heard of. I paid the man, was constantly updated, and got a call when to expect them. The white glove worked great.. I kinda laughed because my driveway is 2500' long into the woods. I think I got the better end of the deal on white glove. Lol. After setup, they worked perfectly. Where I think you need to be 6'4" or taller to fit in the Apollos, these Escapes seemed designed around my 5'10" frame. I love the controls. I'm always searching for the wired remote on these Apollos where the controls on the Escapes is smooth, flawless and always convenient. Oh, and they are a relative steal compared to the others. This is a no-brainer. And Roman deserves the success he is obviously getting. He works hard to saye what he's gonna do, and them do it! It shouldn't be that hard. Great job Roman! Thank you. I got to check both chairs out at the warehouse and WOW. Both of them are really amazing. They feel sturdy, they feel comfortable. The power headrest really put over the Escape for me. I could live without the tray, the storage, and the cooling cup holder, but after laying in the Escape and using the powered headrest I was in love. It made it so no matter what position I was in, my head had perfect support. Ive read a lot of posts of people ordering from 'Roman' but I can't seem to find out how to contact him. Can someone give me his email? website? Something with prices? Thank you. Ill check it out now. i have workers in my home theater today fixing my wall so that i can put my screen on it, it was made incorrectly originally in some sort of 16:12.8 format that I am unfamiliar with, so they are pulling out wood moulding and everything and recreating the wall, so once again, so chance of me getting in there to sit in the chairs for any time. I was all set to order a set of Berkline 45034 (domestic product) seats when Roman broke the old news to me that they went under. I wanted the 45034 because when I went to Roman's warehouse, I was really disappointed in the Berkline's import product quality and figured the domestic must be made much better. Anyway, it appears the Lagoon style is a replica of the 45034 minus a few features which is great for me but I am still on the fence. The Lagoon is not a replica of the 45034. It does have similar shape of the back which is quite comfortable and give you good lumbar support, but it has different shape of the armrest that creates a nice curve and feels very natural when your place your arms on the armrests. The Lagoon-1011 also has different (narrower) footprint. Pocket coil spring cushion will give you much better support and longevity, and the stainless still inserts create much nicer look. They are also more practical because you can easily remove them for cleaning.